IRVING — The experience might have been sweeter when Jordan Spieth was 16, but he didn’t let it show. He stayed on par with the paradigm that got him here. After his not-so-stellar finish at the golf tournament closest to his home and heart, he demonstrated the class and composure that his family and Catholic school settings always prized and never under-rated. 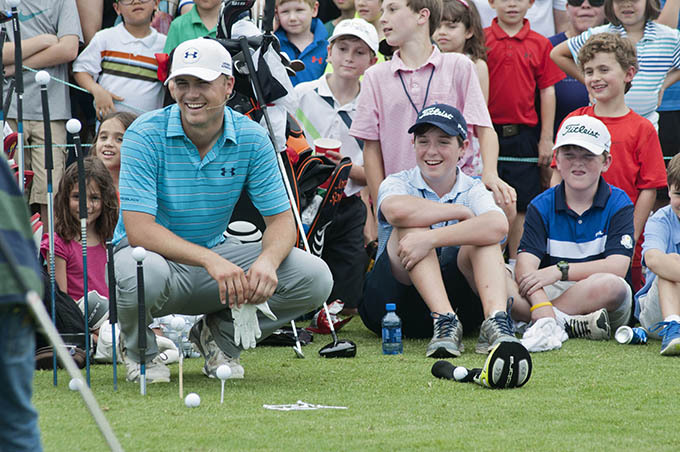 From conducting a youth golf clinic prior to the AT&T Byron Nelson tournament on May 26, to finishing in a tie for 30th on May 31, Spieth, 21, delighted children and fans of all ages. Spieth said that some aspects had changed since his PGA Tour debut and better result (a tie for 16th place) in the same tournament at the TPC Four Seasons Resort at Las Colinas five years ago. Spectators then and now could tell that Spieth clearly captivated the children who followed him and whose caps and visors he tirelessly autographed. But they seemed younger each year, said Spieth, a 2011 Jesuit College Preparatory School graduate and the 2015 Masters champion. “It’s really cool,” he told reporters on May 31. “It’s kind of odd. Each year, I can kind of appreciate it more given I’m a little further from their age. Spieth’s mother, Chris, said that perspective never was a problem for her son. “He has a special place in his heart for young kids who want an autograph,” Chris said as the family prepared to travel to Chambers Bay in University Place, Wash., near Tacoma to watch Jordan in the U.S. Open, which concludes on June 21. His sister, Ellie, was born with a neurological disorder. “She’s a happy, happy girl who adores her brothers,” Chris said. Spieth’s brother Steven, also a Jesuit graduate, attends Brown University. Chris said that Jesuit offered the values that she and her husband, Shawn, wanted for their sons. “We were blessed to be able to send them there,” said Chris, who worked at Jesuit while her sons were students there. “I felt strongly about having that discipline. All six of the children in my family were raised in Catholic schools in Pennsylvania. Jesuit did not give Jordan any special entitlements. Grace in defeat at the 2015 Nelson characterized Spieth, who won the Masters with a record-tying score of 18-under-par on April 12 at Augusta National. But it was the aftermath of the whirlpool of a Masters title that impressed Jesuit golf coach Cathy Marino, a former LPGA Tour player who first spotted Spieth’s golf skills when he was a student at St. Monica Catholic School. Spieth’s stunning Masters triumph had not tampered with his temperament, to judge by his sunny smile, enthusiastic greetings and fist-bumps as he chatted with children at the May 26 clinic. “What’s up, dude?” Spieth said as he high-fived a curly-haired boy of about 6. Rainy weather had postponed the clinic from Memorial Day to the next day—a PGA practice-round day. Chris said that her son would have been excused from hosting the clinic because of its date change. On the tournament’s final day, Lucas Valelly, a 2012 Jesuit graduate who attended Christ the King Catholic School, cheered from the stands as Spieth arrived at the 18th green.